For most people, Bangkok is a city of bright lights, bars, hotels (at both ends of the scale), traffic congestion, temples and shopping. 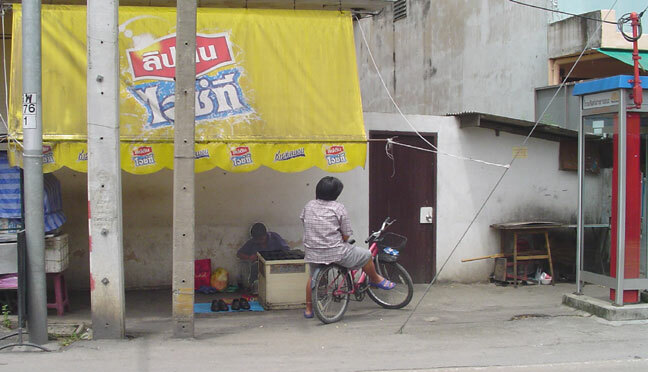 It is said that the Thai national sport is "Shop 'til you Drop." It is all of these things. For those of us who live here long-term, it is also much more. There are countless wonderful little eating establishments tucked away where tourists never venture; Thais spend far more time in temples than the tourists, and there are some realy good and quiet roads. I found a new road this week going to and returning from my annual visa stamping. This morning, as I had a couple of jobs to do, after signing some papers at work, I went into the western edges of the city and took a few pictures before lunchtime. On the way to the first job I stopped off to take a picture of the access bridge to the new road. It starts beside an elevated section then turns right beneath it. 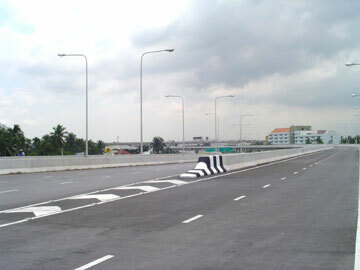 The road itself will eventually run from the northern approaches of the city, on the way to Suphan Buri (also linking with a new bridge over the Chao Phraya river) to Sathorn Road and the Thaksin Bridge -- the name has nothing to do with the current prime minister who, like the bridge, was named after a historical king. 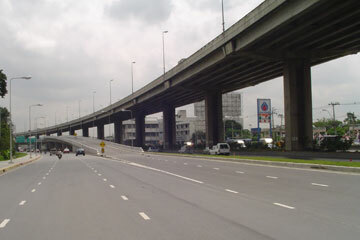 One part of the road, from Petchakasem Road to Sathorn has been open for a few months already. It annoys me that the last couple of kilimetres is not open to motorcycles: you have to come off the road, go through a set of traffic lights and rejoin after using a side road for a while. 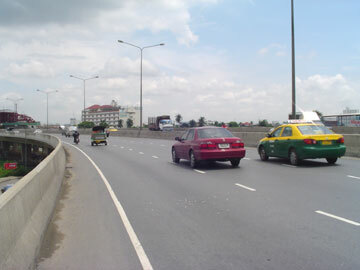 At one bridge (Rama 3) on another road, it is even worse as riders are forced off the bridge and have to go through 5 sets of lights: what would take 1 minute can take 30 by bike. Needless to say, I ride in Bangkok on special occasions only. 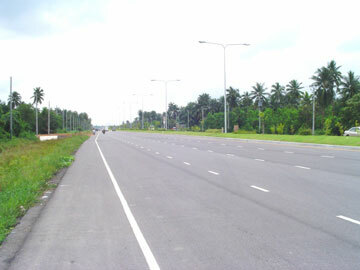 Right now, the new road runs from the suburb of Talingchan and links with the section that starts at the Petchakasem Road. 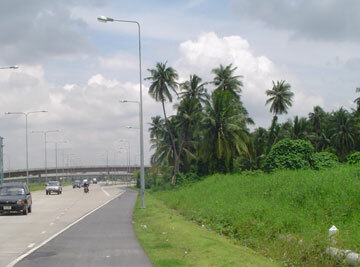 While it is virtually free of traffic and restrictions, let us revel in what we have. 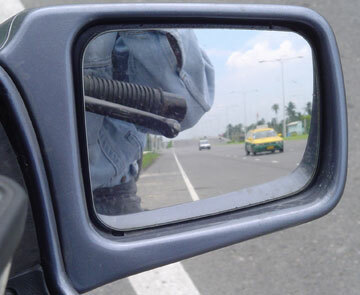 Unfortunately, the openness is an invitation to speed; and in the evenings young riders, with small bikes and without proper protection will exceed the limits of themselves and their machines with inevitable fatal consequences: the figures here are alarming and the reaction from government is predictable. I started by dropping some shoes off for repair: end of semester, I now have time to do this. 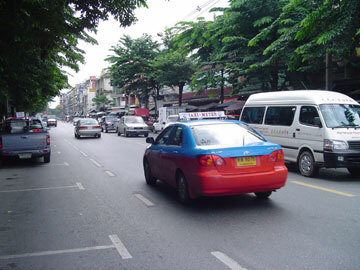 I parked up in Ban Khun Non and had a spare key for the K100RS cut as I had a couple of blanks. I have used the same guy since I first got the green K100 some years ago. When I had the K100LT for a while, that had bags with no keys: he made keys for it. 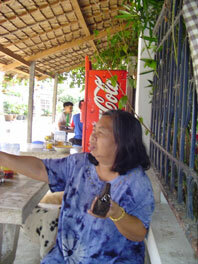 He had no change this morning and I only had 500 baht, so I said I would come back later and went to get a haircut. The haircut is really relaxing. I always have a shave too and the barber removes hair from the forehead and the ears, and trims the eyebrows too. I often fall asleep while he is working. The cost is about $2.50US. I went back to the bike, paid for the key and took some pictures of a typical street scene. 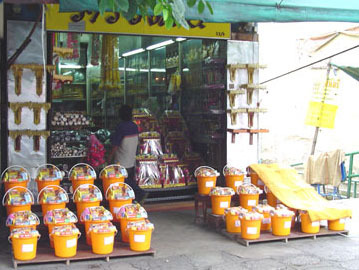 One image may be of interest in terms of cultural differences: the shop where temple gifts can be bought. When I showed this to the houseboy, he wondered (out loud) why on earth I was including something so commonplace. Births, deaths, weddings, making merit: all require that the monks be given gifts (including money) and new robes. The buckets are recycled. Back to the cobbler to get the shoes (another $2.50) and then out to the main road where I made a left then another left onto the new section. 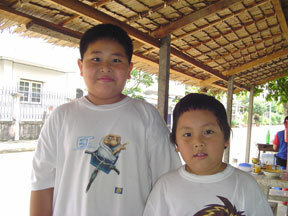 When you look at these images, you must remember that all of the images are taken inside the city of Bangkok. Admittedly Talingchan and the adjacent areas have long been market garden areas, but it may give some idea of the sort of environment I live in. The shack is not mine. It is only once the Petchakasem Road is crossed that we arrive at more dense sections of the city; and this is where I turned round. 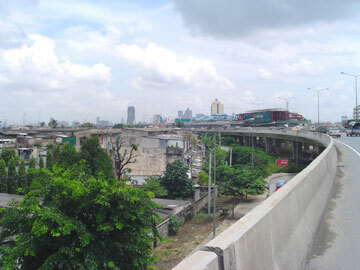 The photographs show a view towards the city centre and a section of the elevated railway -- the "Skytrain" -- that is being extended south of the river. It took over 20 years to get this built and then, when people started using it, it was realised that it was not long enough: maybe one day it will reach the suburbs and serve the people who should benefit most. On the way back, I saw that another section of road, heading out towards the far western edges of the city, had been opened (since Tuesday -- it is now Friday) and so I had a run along there too. This had a fair amount more traffic on it and is obviously a boon to locals as it will cut out part of the Petchakasem Road which is jammed from early morning until quite late. What is also obvious to me is that, although right now the areas of both roads that are being dissected are green and clean, people are already setting up areas which will turn into restaurants and shops, as well as a couple of places earmarked for housing estates. On one stretch I saw later, which had not yet been opened, a finished restaurant was waiting for its first customers. On this unopened section, there was already the first accident. 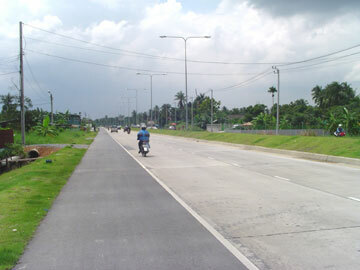 With one side of the road unopened, all traffic uses the single carriageway and two vehicles -- one of them a cement truck -- wanted to be on the same stretch at the same time. When I was using that part later, and a pickup truck wanted my piece of road, I graciously declined any confrontation. I went back the the intersection that currently is the beginning and, on the closed bridge took some more photographs. In Thailand if a raod is closed, it is open if you can get access to it. I remember writing an essay -- the idea came to me as I was driving through the streets -- late one night in Illinois, sat in a car park that was open. As the police officer explained, "Even though it is open, it is closed." Coming onto the bridge, I had had to go round some high school students who were using the space to practice for a marching band: as popular here as it was in the US when I was there in the 80s. 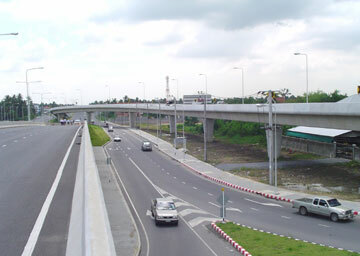 Some of the newer section, near Talingchan is elevated, until it goes past the Talingchan railway junction. 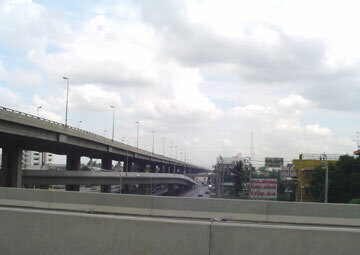 The track on the left comes from Bangkok Noi, and is mainly for trains to Kanchanaburi, while the tracks on the right come from the main terminus at Hualamphong. 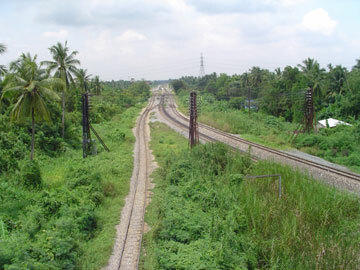 Trains on this line go to the south, and to Malaysia and Singapore. Road, rail and, of course, water. 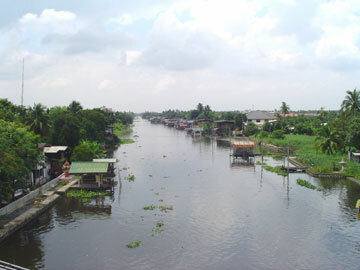 The canals have been a major source of transportation in and around Bangkok for many years. 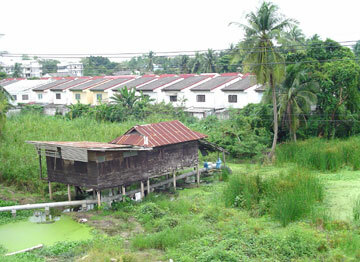 They have also major drainage and flood-prevention properties. When I looked over the parapet to take the canal image, I saw that, adjacent to the water was a small laundry: I could not resist this one. 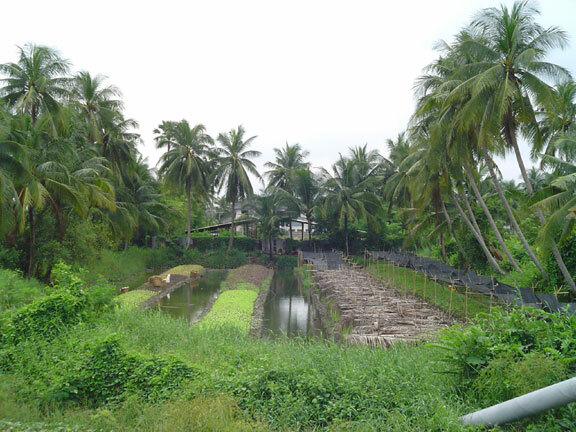 As if to emphasise the nature of this part of Bangkok, I found this tiny market garden just north of Talingchan. 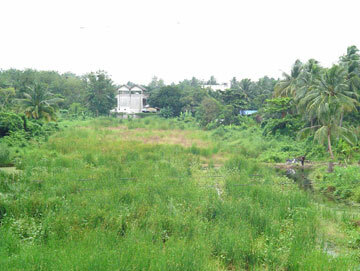 You will note the raised growing areas with small irrigation canals between: the owner will walk around patiently scooping water onto the plants, using a half coconut shell on the end of a long stick. It was time for lunch, so I headed back to the highway and then took a fairly quick run the 10 kms or so to my area. 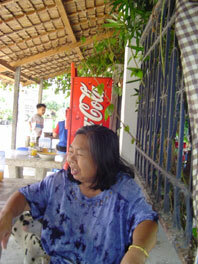 Rather than eat rice today, I decided on a street restaurant in the estate, set up by a local man (now retired from Thai International Airways) and his family. Like many small restaurants, this seems to support as many as half a dozen people, maybe more. I decided on a bowl of noodles with a rich and spicy sauce. Pork and some local vegetables were added. While eating, some of the local kids -- I have known this pair since the younger one was born -- came along to play with their friends. The grandmother, Tig, tagged along a few minutes later. She brought her own rice. 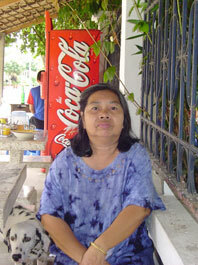 She is well-liked by the few foreigners who live in the area and has a good sense of humour. Always ready with advice, and for a good gossip. 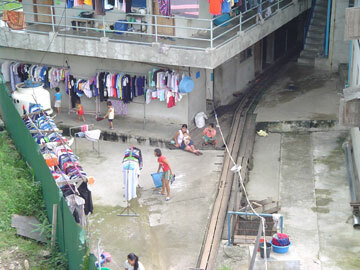 Another Bangkok, away from the bars and the bright lights.